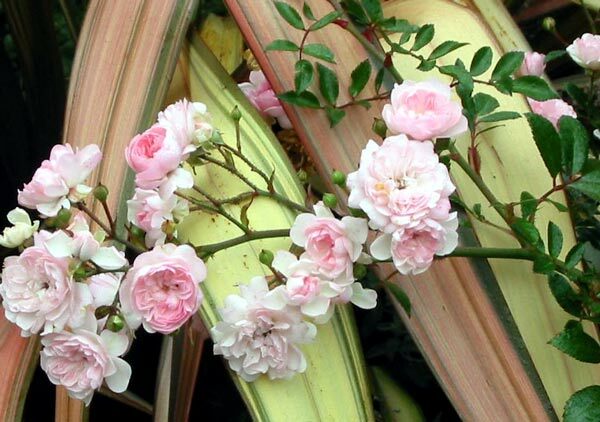 The patio gardens are a source of pink warmth and wonderment in Autumn and early Winter when The Fairy Rose flowers alongside a pink leaved flax (Phormium). In mid-winter the warmth of the coloured leaves is most welcome. My Fairy Roses came from cuttings taken off one originally purchased plant. I grow this rose in many different places in the garden, and always enjoy its flowering times - it bridges the gap when most of my other roses are resting. 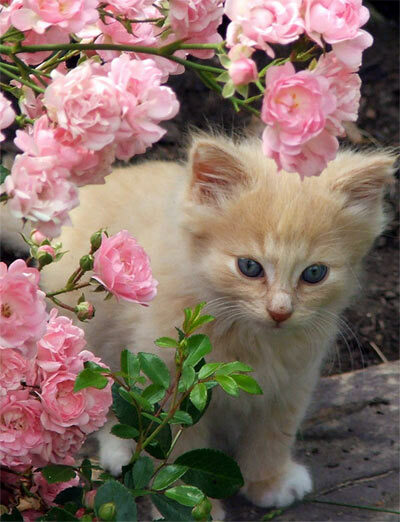 It's the classic pretty pink rose - perfect for a kitten to have his photograph taken next to! This is big Fluff-Fluff - when he was tiny! As for the flax - well, it's merely one of my many small hybrid flaxes whose colours are absolutely stunning. New Zealand gardeners don't know how lucky they are to have such beautiful flax hybrids in all the nurseries. They're never expensively priced, either! Every Moosey garden border has at least one small coloured flax, as well as the clean shiny green. In the busy summer months the coloured flaxes in my garden blend in with the surrounding roses and perennials. It's not until the depths of winter that they are truly appreciated for the subtle colour they bring to the garden. I have to remember to trim out any plain green leaves. 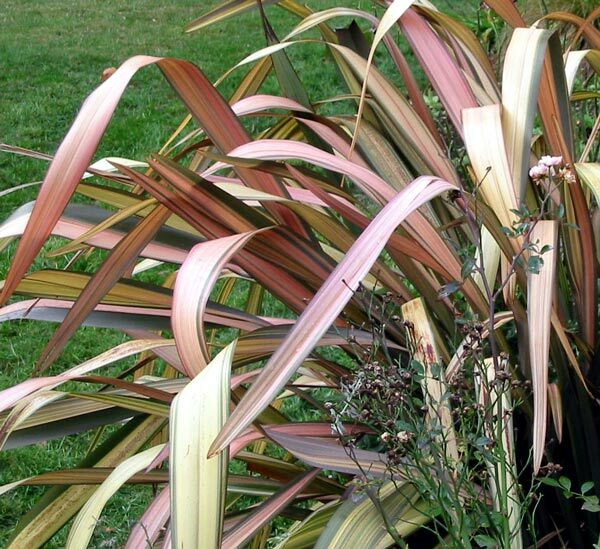 Often one whole half side will revert to the species Phormium Tenax - this habit is very annoying, since the species is over two metres tall. I have enough problems with plants outgrowing their allocated positions without the nature of Phormiums conspiring against me! 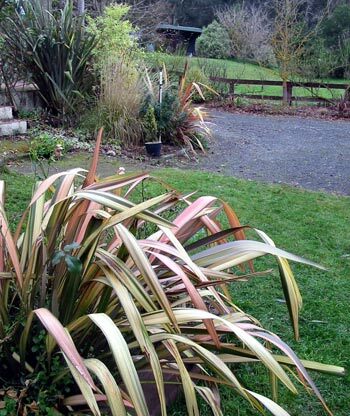 In this photograph taken in the very middle of winter you'll just see the echoing flax by the gravel. With no flower colours to pull focus the flaxes are very much centre stage. In the distance is the Frisbee Lawn - all its fence roses are waiting for their annual prune. Over the lawn is the Stables.